CARROLL GARDENS — For Brooklyn mom Erin Kelly, her then 4-year-old daughter's infatuation with Cinderella was getting a bit tiresome. Playing the role of "Cinderella," her daughter Lydia would get on the floor and pretend to clean while Kelly took on the part of the "Evil Step-Mother." Fed up with this game, Kelly decided to introduce a new princess into Lydia's life. Kelly started to tell her daughter about the iconic ruler of ancient Egypt, known for her intelligence and gift for pageantry. Lydia, Kelly soon found, was hooked. "This is not, 'I'm passively waiting for a guy in my fancy dress,'" Kelly said. Lydia is now 13 but her childhood interest in real-life princesses and queens inspired Kelly to share those stories with other parents and children. "Powerful Princess" is the answer to moms and dads who want their kids to learn about princesses in history and for those in need of a change from Disney's lineup of monarchy. "Because how many parents are not sick of that 'Frozen' song?" said Kelly, who has lived in the neighborhood for 15 years and has two children. She started by hosting school clubs and later organized after-school sessions and workshops for kindergarten to third graders with games, crafts, stories, dress-up and activities about royal women from around the world. In May, she expanded her work to include birthday parties for ages 4 and up. 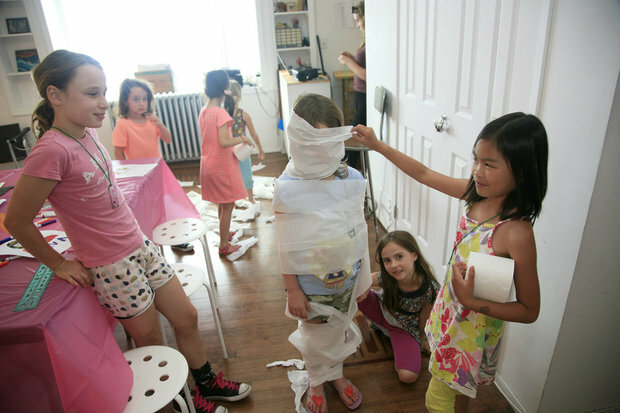 Cleopatra-themed parties, for example, include an arts activity, learning about hieroglyphics, creating a cartouche and a mummy wrap with toilet paper, Kelly explained. Kelly has since taught little girls about heroic women such as Queen Elizabeth I, Rani of Jhansi, Queen Christina of Sweden and Njinga, Queen of Angola. While researching these powerful princesses, Kelly looks for stories that she feels would resonate with her young audiences and be fun for them. She also searches for themes that kids might be able to relate to their own lives, like speaking out and standing up for oneself. "Each princess sort of has a super power," she said. For more information about Powerful Princess workshops and parties, click here.